Today's challenge is about quotations and the difficulty of pinning down an accurate source. "...stories about my death are premature..."
.. quickly lead you to a number of pages, where you can quickly learn that Mark Twain actually wrote in the New York Journal of 2 June 1897 his famous words "The report of my death is an exaggeration." You're starting to get a hint about what the challenge is here; it's figuring out which author attribution is correct! A big part of the problem is that quotations are often improved upon after the original was uttered. That's what happened to Twain's quote about "report of my death..."
Luckily, usually enough of the core phrase remains, in Twain's case, "my death" and "premature" always remain as part of the quote. There's enough of the core left to track down the actual quotation. This gets a bit tricker when the quotation is transformed by mishearing, as often happens with song lyrics. On his album, Jimmy Hendrix does not sing " 'scuse me while I kiss this guy" in his song Purple Haze (although he's claimed to have done so later in live performance, but I digress). A misheard lyric is often called a mondegreen. (You could look it up:  [ define:mondegreen ] ) All of which makes quotation attribution a sometimes slippery slope. Answer: What do you call a rotating flower? This was another hard question, so don't feel bad if you didn't get it instantly. That's part of the point of this blog--search/research questions often open up into fascinating areas that you might not have expected when you started. [ rotation flower stem ] – and found nothing. By skimming through that book, I learned the words “phototropism” and “heliotropism” (for movement towards light, and more specifically, movement towards the sun). That was a pretty good article, which in turn led to me an article from the journal Natural History -- where learned that heliotropic plants can be much warmer than surrounding regions, giving insects a warm place to be and that the pulvinus is a plant organ for sun tracking - not quite what I need, but getting close. But in reading this article from Natural History, I got the idea that what I was ACTUALLY looking for was not a tropism (which is a response to external stimuli), but something that's part of the natural growth pattern of the plant. which led me to an article on Answers.com about yet another word: phyllotaxis. After 4 queries and about 10 minutes of reading through articles, I've finally figured out the word that describes the situation at hand... that is, the rotational development of a plant stem as it grows outward. While this is all great and good, I really really want to confirm that phyllotaxis is causing the mustard stem (and its flowers) to rotate as they grow. And this is where I start to get stymied because I haven't yet found a convincing first-hand account of phyllotaxis in mustard plants (or a closely related plant, say another plant in the Brassica family). And I find a JSTOR article “The origins of the spiral theory of phyllotaxis” William Montgomery -- looks interesting, but they want $38 for the article (arrgh! we call this a paywall, and it's deeply, deeply annoying). SO... in the end, I've figured out what the term and concept describing this behavior is (phyllotaxis), but I have yet to find anything on the web that's specifically about the phyllotaxic movements of common mustard. Looks like I'll have to take those pictures myself! Maybe a weekend project!!! Wednesday Search Challenge (March 24, 2010): What do you call a rotating flower? I've probably mentioned that I'm interested in wildflowers. They're one of the highlights of springtime in Silicon Valley. Yes, we have tilt-up buildings and endless shopping malls along El Camino Real, but almost everyone also lives within just 5 miles of some kind of open / green space with wildflowers gracing the stage. Since I grew up in LA, this springtime spectacle still amazes me. 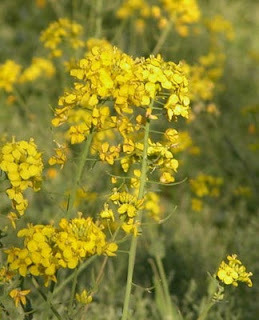 One of the most common wildflowers in the area is mustard, which fills fields to make a brilliant yellow landscape. Supposedly sown by the Spanish missionaries when they first came to Alta California, they're pretty much ubiquitous. I was sketching one particular plant last year when I noticed a really odd thing. I only had a few minutes to sketch, so I did a quick drawing and then left, vowing to return the next day and finish. But when I came back and sat down, I noticed that the flower stem was in a different position than I'd left it. It wasn't just pointing a different way, but the flower stem had rotated slightly around it's long axis. I only noticed this because I went back to draw the same stem / same flower, and found that it had moved with respect to the background. What's going on here? I got curious about this and started to search for an explanation of this behavior. (Yeah--think about it.. .this is plant behavior.) I know that some flowers--sunflowers spring to mind--follow the sun across the sky, but I'd never heard of any flowers rotating on their stem from day-to-day. The challenge question should be obvious by now... What's this rotating behavior called? How can I look up more more information about what's really going on? Note for teachers and librarians: This is a fairly sophisticated question, but representative of the kind of question kids have. They don't know any of the unique and specific terminology that the biology/botany books would use to describe this, and chances are that you don't know it either. This is where a little search skill really helps out..
know a lot less than they think. And worse, they don't know what they don't know. Sara and I clearly agree--there's much to be done, and teaching kids how to do research is a critical part of their education, it's not really optional. She makes a good argument, very consistent with what I happened to also write yesterday. I always worry when school budgets are cut back, but I deeply worry when it's library staff that's being let go. Chin up, Sara! Let's get that parcel tax passed, lest we create a generation of kids who don't know how to do any kind of research, let alone grow up to become an informed electorate. Why we need to teach people how to search..
Is there even a need to teach search? A goal of Google search is to be so simple, so obvious, so effective, that the searcher never needs look for help. In principle, search just ought to work the way you imagine it will. The assumption is that Google searchers will search for things we can understand… and that the Google system will just “do what’s right” automatically. If this were true, then there wouldn’t be any need for courses to teach people how to search. Yet, when you look around, it turns out that there are a fairly large number of courses that are being taught. Classes like “Become a super Google searcher” promise to teach you the tricks you need to search effectively. How many courses are there? In truth, I don’t know. But I started looking, and once I started looking, I couldn’t see the end of the list. Essentially every library I checked in California (something like >95% hit rate) runs a class to teach Google search (or as you’ll quickly learn, it’s usually called “Internet search,” so as to be fair and equitable for all search engines). There are entire companies that do nothing but teach people how to use Google search in the enterprise. So the need is perceived, there seems to be a market, and from direct observation I can tell you that while most people CAN search, by the same token, most people don’t do a good job because nobody ever really showed them how. What needs to be taught? Here’s my short list of things that need teaching; a list of the three most important skills and pieces of knowledge that searchers need if they’re going to be great at search. I teach a lot of classes on “how to search.” In the past year, I taught 14 classes of students (that’s around 700 students), and looked over the shoulder, helped out and watched many of those students. Some were advanced, some were the rankest of beginners—but the overriding thing they had in common is they knew how to add terms to a search box and how to get the results... but if the answer wasn’t there, they had little strategic knowledge to fall back on when things went wrong. Luckily, many of the questions searchers bring to Google are pretty simple. Many are simple navigation queries (which Google does spectacularly well), many are searches for simple facts (“Who won the battle at Little Big Horn?”). But once the question gets to be slightly more complex, you need some fairly deep knowledge about what to do next. Once the searcher gets beyond the basics—“What was the Army’s goal in having General Custer at Little Big Horn?”—then the searcher needs a search strategy. In its simplest form, strategic knowledge can be knowing how to try out multiple versions of a search, testing out various combinations of terms to explore variations on a query. But you’d be surprised how many people create a query, do a one or two modifications of the original query, and then give up. This is a difficult behavior to see in logs, but one that I see all the time when helping people at the library. What’s worse, though, is that most searchers don’t know what to do when the results they’re seeing are all off-topic with respect to the question they’re pursuing. When the results coming back don’t look right—you need to have something to do, a way of making progress. That’s what a strategy does for you. How can we help make our users competent searchers in an age of many competing and conflicting information resources? Once our users begin to step beyond the simple question and navigational query, they need to know about other ways to approach the search problem. We need to teach strategies for doing searches that are more sophisticated than simple fact-finding and navigation searches. I’ll make a major wager here: I’ll bet a dollar that this is a very common behavior, and not just among African journalists. I’ll go further and say something that’s not widely believed: Most people actually are not very good at searching. The situation of the African web just makes the problem more apparent. It’s tempting and easy to think that you’re a good searcher: Can’t you just Google something and get the something you seek back as an answer? Yes, you can… but the key thing is… it’s just something back. How often do you, when you’re searching, check that what you got is really correct? How do you assess the credibility of a web result? Most people say they just look at the results and—to get right down to it—make an intuitive judgment about it. Does the page look professional? Does it seem consistent within the visual style? And, most of all, does it line up with things I already know? This last factor is important because confirmation bias is a well-known source of problems. If you’re expecting a particular outcome, or even a particular KIND of outcomes, then we know you’re more likely to see that in the results. Your eye even has the ability to spot confirming data on the page in a pre-cognitive scan. Oops. That can be very bad. Take a look at the famous “tree octopus” website. (Don’t know about it? Search for [ tree octopus ] and look at the first result.) It looks very polished and professional. More than one teacher has been taken in by its gloss and surface-level coherence. If you’re an adult who’s grown up knowing some basics about marine fauna, it usually only takes a minute before you realize that it’s totally and utterly bogus. But suppose you didn’t grow up with marine biology textbooks in your public library. Then, the tree octopus site looks really good—very credible. And, what’s even worse, in cultures without a long tradition of visual styles that convey authoritativeness (e.g., newspapers in east Africa), implicit web authoritativeness is rampant. So what DO you do to assess the credibility of a web page? Turns out there’s no simple answer. www.martinlutherking.org seems credible, until you look at what other sites link to it, or use a WHOIS lookup and discover that the site is funded by a white supremacist group. But if you don’t know how to do these kinds of fairly sophisticated background checks, how would you ever know? To an extent, we’re all third world people for some domain that lies outside of our immediate knowledge. If you’re a Silicon Valley person, how would you gauge the credibility of web information that tells you about low-cost fertilizer treatments for your crop of Kenyan millet? We need to teach people how to look at information they find on the web, via Google, and make assessments of credibility. A crucial factor for being an expert searcher is knowing what kinds of things you can find. When I teach classes at public libraries in Silicon Valley, I’m always surprised at how few different resources people recognize or how many different kinds of resources exist. This problem extends beyond knowing what Google has indexed to include knowing what's possible to find with web search. The equally terrible implication is that some people honestly believe that if they can’t find information on Google, then it doesn’t exist, and they give up in their search. In short, people who don’t have a good idea about what’s possible to find don’t ever consider looking for it—they don’t ask for things they don’t know about. As a simple example, how many people know that Google Earth has archival aerial imagery of many parts of the United States. That knowledge is critical to being able to do many kinds of comparisons of land use patterns, watershed analysis and deforestation over time. Without that kind of knowledge—without knowing that archival maps are available—the searcher is stuck, and unable to progress in their search. Knowing at least what’s possible, knowing the full range of human expression and information availability opens your mind to asking the question. What you know you can search for is a powerful conditioner of what you do. An important job that we need to take on, I believe, is to teach people about what kinds of knowledge are possible. Knowing about something isn’t the same as knowing that thing in depth; but it does open the possibility of searching on that thing in the future. We need to teach the range and scope of what information is available in order to let people know what they can find (and understand). Search engines are remarkable tools. Google is simple, powerful and massively transformational. It has changed the way everyone thinks about information. Yet even simple and powerful tools need knowledge to be used well. Even Apple, famously known for their emphasis on ease-of-use, has to teach their users how to use. Witness the Genius Bars at the local Apple stores, the Apple-dedicated magazines, or the plethora of online forums that people use to exchange tips and ideas. That’s a lot of support for something that is claimed to be easy. The reality is that computers, even Apple computers, are incredibly sophisticated devices. Once a user gets beyond the mere basics, they need help. I want to argue that Google has made many right decisions about ease-of-use, but that there is still a long way to go. Google CAN do more than provide fast answers to navigational questions, fact lookups and pointers to Wikipedia articles. Google can, and should, teach people how to use Google to see more deeply into a topic, to come to a greater understanding of anything they want to understand. I want to argue that Google should teach people how to think about research, rather than just search. There’s an important shift in thinking here. The difference is one of scope and scale. A research task is what people do to solve sophisticated problems, while a search is what they do to solve sub-pieces of the larger problem. Google supports search very well. But we don’t help our users with their larger research task. In the end, from a business perspective, better searchers will do fewer searches-per-task than unskilled searchers, their time-to-result will go down. That’s good—we want searchers to have short, fast, effective experiences (we know that brevity of search task is highly correlated with happy users). BUT we also know they will also take on more search tasks overall. In every field study and class I’ve run, follow-up surveys and history analyses have shown that more skilled searchers search more. They grow in their capability and knowledge. So what should Google do? Improvements in search quality (such as spelling corrections, suggestions, related searches, and so on) will continue to make everyone better as the technology advances. But we can do more to make Google users significantly better in addition. 1. Build learning into Google search. This means making tips and help content be targeted and precise; making better use of the Google Help Center; let users know when they have opportunities for improving their search at both tactical and strategic levels. 2. Create a search curriculum that can be used widely. We’re doing this already (see: 9 Search Lesson Plans). Google clearly can’t teach everyone how to search, but there are literally thousands of librarians and teachers willing and ready to teach… if only they had some authoritative and reputable content to work with. We also are busy creating some engaging short videos that can be used to teach individual concepts. 3. Continue Google teaching and outreach to the community through classes. Allow every Google office to offer search (and other product) classes. One of the great values of teaching person-to-person is that we come to learn what the key issues and drivers are for our users. Clearly, Google outreach won’t teach more than a tiny fraction of our user population—but it can be an important factor in reaching key players, the teachers, parents and librarians that will carry our message to the rest of the world. This is a great aspiration for Google to have: We should be in the business of showing people how to search and research in order to deepen their understanding of the world. We want to make the world’s information available. We’ve done a decent job at getting a good fraction of it online. Now, let’s teach people what they can do with all that. They can do more than look up the latest celebrity news, they can transform their lives. “Sensemaking” is what you do when you’re trying to figure out some complicated problem that involves too much data, or the wrong kind of data. It’s problem-solving, but of a particular type. When someone says “I need to make sense of <something…>” generally what they mean is that they don’t get what’s going on in a deep way. So what do one do? Answer: You start collecting information about what’s going on, then start to organize it in ways that make sense. That’s kind of abstract, so let me give you the smallest possible sensemaking problem I could think up. Now I’ll tell you that the number 10 fits into this sequence. So… where does 10 go? If you’ve done problems like this in the past, you might have done what I did and made a table of numbers, with each column showing a different operation on the numbers. The reason for making a table like this is to try different artithmetic operations, looking for a pattern that you recognize. In this case, we’re looking for a numeric relationship. So first I try dividing the number by 10 (that’s the second column). That’s better, but I still don’t recognize any pattern. 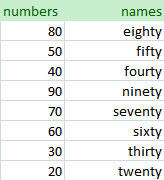 Next I try subtracting each number from the one above it in the sequence (that is, 80 – 50 = 30, which gives me the second number in the third column). This is a clever trick that often works for finding simply polynomials (more on this in another post), but it's giving junk here (that -50 in the 3rd column is just a mess). Then I tried dividing the number by 10 and then squaring the result. (80 / 10)^2 = 64. No such luck. This is just mucking around, and not revealing anything to me. I try a few other operations… and nothing seems to be working. Usually if you just fool around trying different operations on the sequence of numbers, something will emerge. I step away for a bit, and then realize that maybe this question is NOT a numeric question, it just might LOOK like a math problem. Perhaps, just maybe, it’s a TEXT question. That’s the kind of thing that makes puzzles so hard—you focus intently on one possible solution that you don’t think about anything else. So I write down all the names of the numbers into my table. Now it looks like this. And I notice something interesting with this pattern… The names of the numbers are all in alphabetic sequence! It has nothing to do with any mathematical formula at all! Now let’s pop back up to the question of sensemaking again. In this case, I’ve been using a spreadsheet because it’s a handy way to keep track of a sequence of numbers. Once you’ve got that sequence, you can do various operations on them quickly and easily. As you can see, I can even sort by alphabetic sequence to verify that everything’s right. In the language of sensemaking, I’ve been “trying out different representations,” looking for one that explains what’s going on with this small data set. That is, I’m trying to find a way to represent that data in a way that has a neat, simple and correct explanation for what’s going on. I must have tried 5 or 6 different representations before I figured out that it was the alphabetic sort order that was the best explanation. That’s part of the process too! For almost any sensemaking task, finding the best solution (or interpretation of the data) means trying out different “theories” about what’s going on. I had the “divide by 10 and square it” theory, and that didn’t work at all. I tried others, but nothing really clicked until I got here to the last step. Once I figured that one out, everything fell into place. As I said, this is just about the smallest sensemaking problem I can think up. It’s not something I can do in my head—I really did have to sit down and fool around with the data for a while, searching for a pattern that explained everything. And, in the end, the explanation is neat and clean; it explains everything. This is not the usual case with real-life big & hard sensemaking problems. If I could make sense of the Middle East situation by filling out a table, I’d do so. But in the smaller less geopolitically complicated day-to-day sensemaking tasks, tables and other ways of organizing the data often help by making the data visible and comprehensible. And that’s almost entirely the trick of sensemaking… converting data from a large, intractable mess into something that’s smaller and has a clear underlying explanation. That makes sense to me so far. Answer: What is that thing in the sky? First off... it's not a UFO, as a couple of people suggested! As I mentioned yesterday, finding things like this--objects or concepts that you don't already know the name for--is pretty hard. And this is no exception. If you do the obvious search: [ bright spot sky ] none of the first page of results is useful. 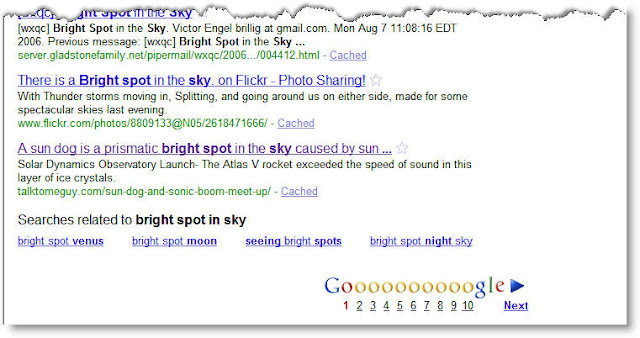 While starting with a few words is often a good strategy, the query [ bright spot sky ] is a bit too generic. In essence, you haven't said much that the search engine can get its hands on. This query is just a few words, and not any usefully descriptive phrase. If you add just one word to make it a slightly more descriptive phrase, a la [ bright spot in sky ] you'll find something useful way down in the 10th result (way at the bottom of the page). There you see the first reference to a term you might not recognize: sun dog. 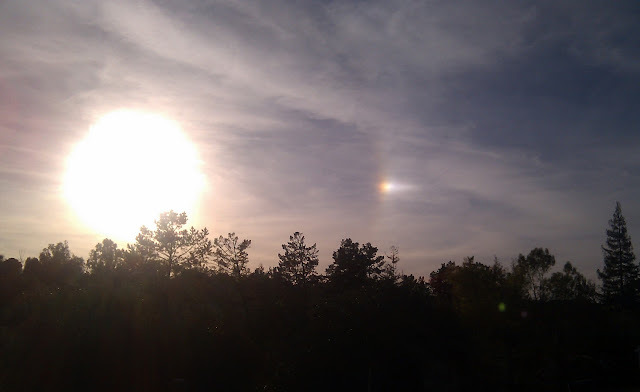 The last result mentions "sun dog"--could that be it? All of the other results are about astronomy and the night sky. Unfortunately, the link is to a video of a rocket liftoff showing shock waves in an atmospheric ice crystal layer. More about that later, but it doesn't seem directly relevant. Except for that term "sun dog"--why is it there? A quick check with define, as in [ define:sun dog ] teaches us that a "sun dog" is "an atmospheric phenomenon that creates bright spots of light in the sky, often on a luminous ring or halo on either side of the sun" (Google found this definition on Wikipedia). This second image looks so much like the picture that I took with my phone that I'm pretty confident that this really IS a sun dog. A check on Wikipedia (query for [ sun dog ]) shows a pretty nice article with multiple images of sun dogs. Interestingly, while that video wasn't useful in and of itself, the text of the snippet suggested that there maybe was a term we could use in OUR search. That turned out to be the trick. As you search, you learn. As you learn, you can improve your search targeting by using terms that you pick up along the way. Wednesday Search Challenge (March 17, 2010): What is it? This is actually a double-edged sword. Because you don't know what something is, you might very well miss noticing it. Yeah, it's true--you tend to miss things if they're not familiar or have a name. This is a really interesting distinction--because you can SEE something, but then when you look away, you'll have a very hard time remembering all the things you saw that don't have convenient names! This isn't the best picture (it was taken with my Droid phone), but it shows that bright patch of sky to the right of the sun with a little bit of a bright arc. As it happens, I now what this is. Perhaps you do too... but pretend for a minute that you don't actually know what this is. How would you find out more about it? What's this thing called? And... how do you learn more about this phenomenon?? Everything you need to know in order to figure it out is right here in this photo. One of my interests in life is understanding the world around me. When I moved to the San Francisco Bay Area, I was initially astonished at how different the botanical world was all around me. I'd look at the hillsides and have NO idea what I was looking at! Low flowering plants, trees, bushes... all of this amazingly beautiful stuff, and I didn't know a thing. So I did what I like to do... I started learning. Went to the bookstore and picked up a few wildflower nature guides and identification keys, a sketch pad, a few colored pencils and went to the local hills and started figuring out what flowers were what. I'd work through the keys (eventually learning what an "inferior ovary" was, and learning how to count stamens). And slowly, laboriously, I started figuring it out. It took me a couple of years (literally!) to figure out 90% of the flowers, and I'm still working on tree identification, but the super-abundance of wildflowers is still my favorite thing to look for in the springtime. But this past Saturday I was struck by something really odd. Wild radish (Raphanus raphanistrum) is a very, very common flowering plant in the area. It blooms very early in the spring, and grows nearly everywhere. It's in the Brassicaceae family, which means it's related to mustard, broccoli, cabbage (and all "cruciferous" vegetables--so-called because their flowers are cross-shaped). But I was seeing it with many different colored flowers. Some were white, some were yellow, others blue and some even a kind of tawny-gold color. Huh? Were these all the same flower? 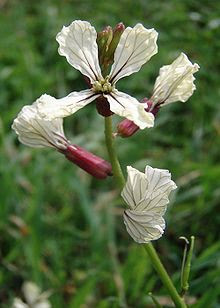 Or were there four different species, all of which looked like wild radish? I spent a few minutes looking around. The first place I checked was the Wikipedia article on wild radish, which isn't a bad summary, although a bit short. The next thing I did was a regular Google search on [ Raphanus raphanistrum color ] and discovered a pile of articles in Google Scholar (which contains many, many journal articles written by professional botanists). Sensemaking, as I think about it, is what people do when they're trying to understand something fairly complicated. It's the combination of searching information out and then re-organizing what they've found in order to come to a deeper understanding. And that's what I started to do with respect to this question of "do wild radishes really come in more than one color?" I started with Wikipedia, which told me that they vary "...colour, usually from white to purple but sometimes light orange to yellow, often with colour shading within a single petal"
Now, back to the Google Scholar results. I started looking at the various papers that Scholar found. The first one I clicked on was "Reproductive biology of petal color variants in wild populations of Raphanus sativus" by a botanist at UC Davis. I know UC Davis is a good agriculture school with a strong botany department, so I'd tend to believe most of what I find from them. But you see what's happening? I'm learning more and more from every article I read about wild radishes. I'd already confirmed my hypothesis about color variations, and now I'm starting to learn why and how such variations occur. The next article I look at implies that petal color is determined by one gene site, and that no pure, pre-European contact versions of the wild radish exist... they've all been hybridized by now! I could go on. This turned into one of those diversions that leads to an immense amount of background knowledge about local plants (which is one of the characteristics of people who spend hours identifying plants with a plant key in hand). But you see what I'm getting at: Sensemaking often proceeds from a clearly defined goal ("do wild radishes have color variants in their flowers? "), towards something less defined ("what's the value of color variants on the fitness of the plant?"). If all you wanted to do was to answer the question, I could have done that on Wikipedia and been done with it. Often, though, the beginning question leads to a richer, more nuanced, more informed version of the question. Sensemaking is often also about how to reformulate your question into something that's richer and deeper, usually by learning about the topic area as you proceed. That's what happened in this case. I now know a lot more about why flowers might want to have variations on their flower colors. And that's probably knowledge I'll use again in the future. I'll see if I can't get some decent pictures of the color variations. If I succeed, I'll post them here.